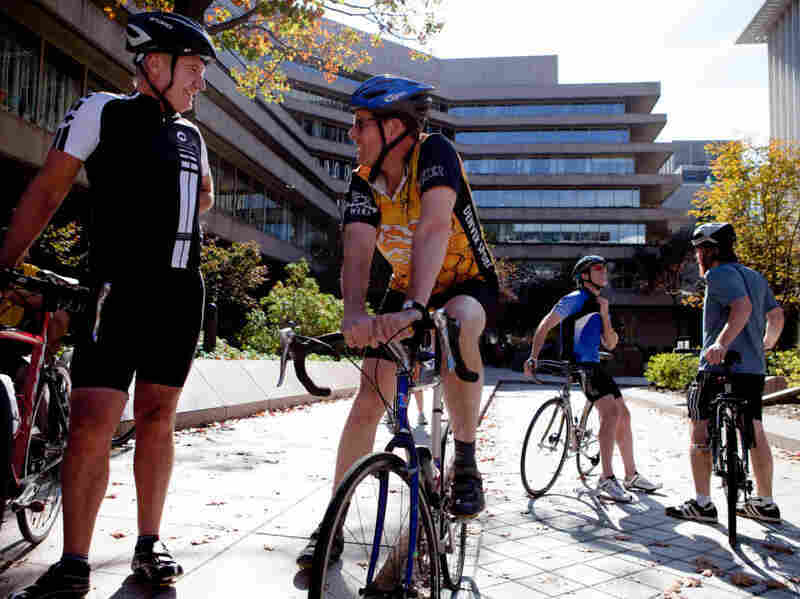 One way National Geographic staffers in Washington, D.C., can get to know their company's CEO is to take him up on his long-standing offer: to go for a lunchtime bike ride. Fahey, an avid biker, says he's just trying to encourage a little exercise -- and he wants the opportunity to get to know folks informally. As the group makes the 15-mile trek to Hains Point along the Potomac River and back, Fahey makes a point of chatting with everyone, staffers say. At National Geographic -- which is a hub of outdoorsy, adventure-seeking types who think nothing of biking busy city streets -- lots of the staffers who join Fahey for the lunchtime rides also use their bikes to get to and from work every day. "I've been riding in for 19 years," says senior photo editor Dan Westergren, adding that he has definitely noticed the boom -- especially as bike paths and bike lanes along city streets have improved. Westergren's commute is a combined 12 miles to and from home. And he says, given all the biking he does, he doesn't need a gym membership to stay fit. "Really, to build it into your daily routine by commuting for me has just been the best thing," he says. If you bike to work in Washington, D.C., Minneapolis, Chicago or San Francisco, you're part of a boom. Cycling has at least tripled over the past two decades in these -- and other -- big cities across the U.S.
"It's almost become a cultural phenomenon," Pucher says. "It's become the 'in' thing to do." For many city dwellers, it's a money saver, a time saver and a way to sneak in daily exercise. Research shows that the extra physical activity that people get from walking and biking to work or school is not offset by less recreational activity. "[Active commuters] actually double the amount of their total physical activity," says Pucher. And as a result, Pucher says cities with lots of "active" commuters tend to be healthier. The most recent evidence comes from a study Pucher and his colleagues published in the American Journal of Public Health. They found that the U.S. cities with the highest rates of walking and cycling to work have obesity rates that are 20 percent lower and diabetes rates that are 23 percent lower -- compared with U.S. cities with the lowest rates of walking and cycling. There are, of course, a few daily obstacles. Take the weather. "In the winter it's just gross sometimes with the ice," staffer Julia Yordanova says. And there are also the dangers of traffic. "It's the cab drivers," says Jonathan Irish. Not to mention the need to try to fit in a shower at the office. "You just try to hide the bike grease on your calf as you're sitting in a meeting," says Barbara Noe, an editor at Travel Books. But hey, if the office culture tolerates a little sweat on the brow -- or grease on the calf -- take it a sign of good health. That's the way Pucher sees it. 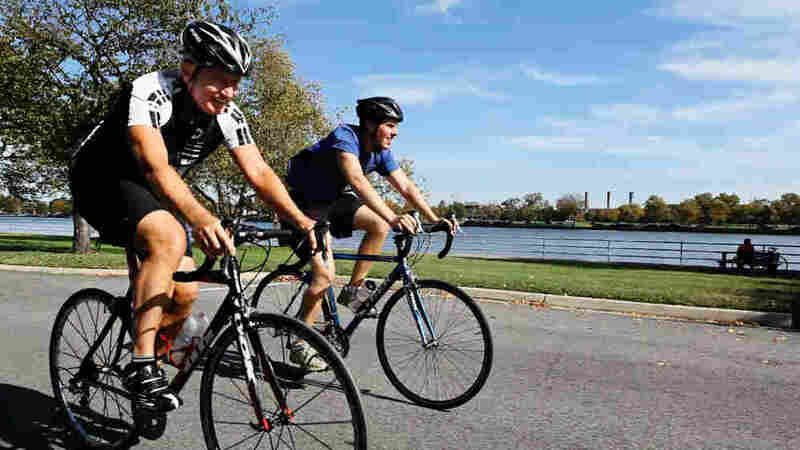 Pucher says, "Most people understand that walking and cycling is healthy. They don't think as something they could integrate into their daily lives."